Computex 2006 Asus has managed to find a cooling solution for its next generation high-end motherboards, using a very small integrated pump and water reservior. The rather large radiator also works as a heatsink for the MOSFETs, which are part of the power regulation on the motherboard and generally get very hot. The list of upcoming features doesn't stop here though, as Asus is also working on a small single line LCD display that will be part of the I/O shield. This will show up any errors during boot, but it's much more advanced than the two character displays used by many manufacturers. Instead of having to look up a hexadecimal code in your manual, the Asus LCD display will actually tell you what is wrong in plain English. Less useful is the display's default mode once booted, as it shows the time - and we can't see a lot of people having a look behind their PC to find out what the time is. The LCD display takes up some space and Asus decided to re-work the rear I/O ports and move the audio connectors to a separate card, much like what Abit has been doing for the last couple of years. Besides freeing up space for other connectors or options at the rear of the motherboard, this allows for more space to fit audio connectors on. 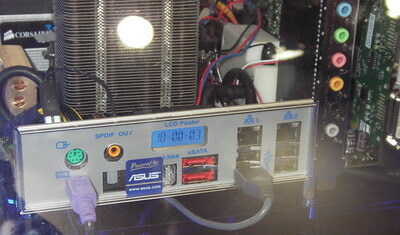 It was not clear if Asus had actually moved the audio decoder off the motherboard as well, but it is using a proprietary interface on the motherboard.